Quarterback and tight end were able to escape the injury apocalypse that was week 2, with the notable exception of McCown. The question now is which players will continue on with their production and which were a flash in the pan. For teams that are streaming either of these positions, it is a weekly battle to stay ahead of the curve. For a look at last week's picks and a glimpse into the future forge ahead with this week's waiver wire picks. Matt Ryan looked like a throwback version of himself in week 2, but can he keep it up against better defenses? McCown sustained a serious shoulder injury and should not be on a roster right now. Flacco has some weapons and the Ravens are going to keep throwing. Ebron should be a decent volume play for the forseeable future. Rudolph seemed to have a nice rapport with new quarterback Sam Bradford. McDonald saved his stat line in one play, but Gabbert still will be looking his way often going forward. Tannehill has a date with the Browns in week 3. That means good things for owners that start the 'fins quarterback. Tannehill slung it all day long versus the division rival Patriots and put up a gaudy stat line. In week three he gets the privilege of facing the laughable Browns' defense. With Arian Foster ailing and the Dolphins run game on the ropes, expect a lot of passes. 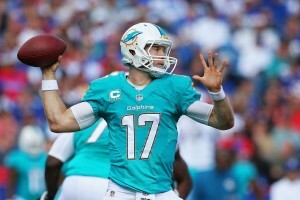 With Landry, Parker, Stills and Cameron out there that should mean more big things for Tannehill. This pick is being made before the Eagles play their week 2 game, but regardless I like the matchup with Pittsburgh. The Steelers have a beatable secondary and Wentz is capable of making all the throws. If the rookie can avoid mental mistakes it could be a big game for him along with Jordan Matthews and Nelson Agholor. This year was a bit different than the last few as Cutler did not make an "breakout" or "sleeper" lists. Cutler is what he is at this point in his career. Week 3 brings a matchup with the Cowboys, however. That is a matchup that is good news for just about every offensive player to come across it. Huge numbers are probably out of the question but 20-22 fantasy points are within reach. That makes the perennially disappointing Cutler a solid one week fill in. Our other fantasy football waiver wire picks will be posted here every week. Pitta was one of the better tight ends in the league before losing multiple seasons to a string of injuries. He is now working his way back to pre-injury form and the results are becoming apparent. This is a guy that I would use a decent chunk of my FAAB to get depending on the current status of your fantasy team. Pitta caught 9 passes for 102 yards in week 2. The Jaguars are the opponent in week 3 and they tend to struggle with skilled tight ends. This should mean that Pitta sees a sizeable number of targets again and with any luck finds the end zone this time. Despite being a popular sleeper candidate coming into the year, Walford is available in most leagues. That is about to change as Derek Carr is looking his way often. Last week Walford caught 6 balls for 53 yards and a touchdown. The quarterback is gaining confidence in Walford and it should lead to big things. Amari Cooper takes up a great deal of defensive attention, leaving Walford able to exploit mismatches and make plays. It was not the breakout game that many predicted for James in week 2. He did see 5 targets however, along with a trip to the end zone. The Steelers score enough points that James is usually worth the gamble in hopes of grabbing a touchdown pass.